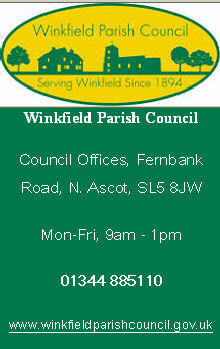 Winkfield Parish Council runs the superb and imaginatively designed Locks Ride Recreation Ground, off Forest Road, Winkfield Row, RG42 7NJ (at the corner of Locks Ride and Forest Road). There is very well - maintained play equipment, football pitches, 'Splashpad' and 'beach area' , barbecue, cricket, pavilion, softball (Ascot Blues base) and a car park. The park can be accessed from Forest Road (gates locked at dusk) . Two senior football pitches (each 90m x 64m) and Cricket pitch (all drained), brick pavilion (14m x 6m) with showers, tea-room, store, etc. workshop/store (5m x 12m), fenced car park, park seats, litter bins and pond. Splashpad, beach area with sand, BBQ and seating area, Adult Gym Equipment, double-zip wire, trampoline. BBQs can be hired by contacting the Parish Office Monday to Friday on 01344 885110. Bookings must be made a week in advance. The large BBQ is £35 for a 3 hour slot and is suitable for family groups of up to 20 people and small BBQs are £10 for 2 hours, suitable for up to 10 people. Unfortunately, the facilities are not available for large organised events.